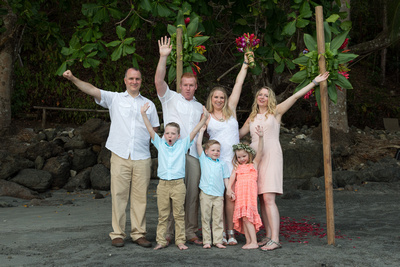 Many of the weddings that I plan in Costa Rica are beach weddings. Costa Rica has some of the most beautiful beaches in the world and with Costa Rica’s 1000+ miles of Pacific and Caribbean coast you are spoiled for choices! Here are some natural decorations and flowers that are perfect for beach weddings, these photos are from a vow renewal I planned at Discovery Beach House in Manuel Antonio. When my phone rang the last thing I expected to hear was, “I’m bringing my wife Krista to Costa Rica on vacation. We’ve been married over 10 years and I’m going to surprise her by renewing our vows” It’s not often a groom contacts me about a vow renewal. They were staying at the Discovery Beach House in Manuel Antonio on gorgeous Espadilla Beach with one of the prettiest tropical rain forests in all of Costa Rica as a backdrop. The setting was amazingly romantic.